Community | Peninsula Dog Fanciers' Club, Inc. The Peninsula Dog Fanciers’ Club, Inc. is committed to supporting the Kitsap County community. The annual All Breed Dog Show and Obedience and Rally Trials held in March at the Kitsap County Fairgrounds allow PDFC to contribute to the community in many ways, including providing significant funds to purchase new K9 officers (including Titan, the newest K9 with the Kitsap County Sheriff’s Department K9 Unit), funds for training and equipment for the K9 Units, funds for veterinary and 4-H scholarships, equipment and grounds maintenance for the Kitsap County Fairgrounds, and much more. The PDFC All Breed Dog Show and Obedience and Rally Trials also bring in revenue to the greater Kitsap County community. 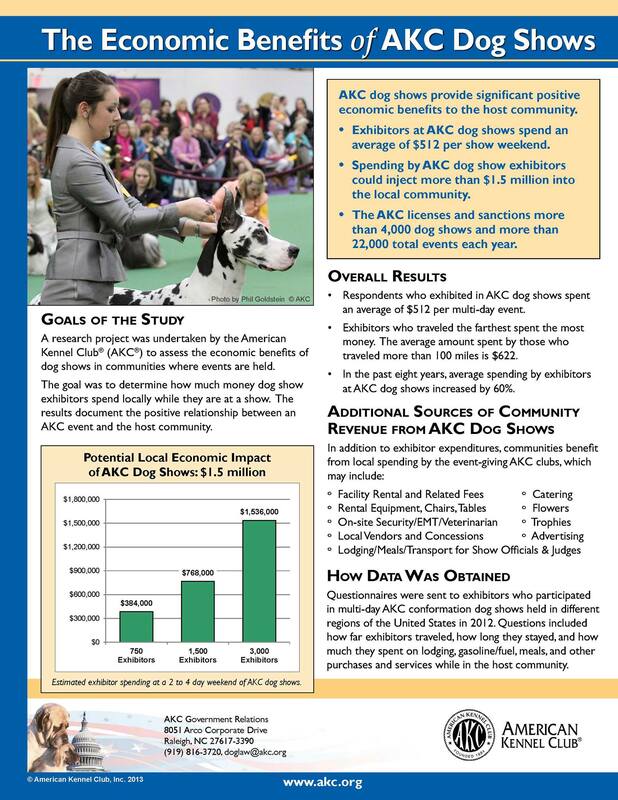 The American Kennel Club produced a flier (posted below) that outlines the types of economic benefits that dog shows have in a community.